Roy also understands the importance of giving back. Every year Roy’s Restaurants participate in numerous fund raisers and events. Hawaii would not be the same without Roy Yamaguchi. Although Roy was born in Tokyo, his Hawaii connection goes back to his grandfather, who owned a tavern in the ’40s in Wailuku, Maui, and who was also a pioneer of sorts in the local supermarket industry. Roy attributes his earliest appreciation of food to his father, a career military man born and raised on Maui, and to his Okinawan-born mother. Brought up in Tokyo within this fluent bilingual environment until the age of 17, Roy could not help but absorb much of Japan’s culture. Yet he still vividly recalls visits back to Maui to see his grandparents, and his first experiences of the Pacific. “My father would drive for hours just to get fresh fish, crabs, octopus and lobster from the piers. From trips to Okinawa, mom would haul back live spiny lobsters. And it seems that I have always loved to cook; whether it was fried Portuguese sausage and eggs for breakfast, or a full-on Thanksgiving dinner for the family, even if it was for credit in a home ec class.” So even before graduating from high school in 1974, Roy knew what he wanted to do: enroll in the Culinary Institute of America in New York’s Hyde Park, where he was to receive his first exposure to classical traditions. After graduating in 1976, Roy’s devotion to French cooking would be nurtured further in southern California, where he signed on for an apprenticeship at L’Escoffier, followed by one at L’Ermitage. Roy still considers L’Ermitage’s late master chef Jean Bertranou to be his mentor. In a June ‘88 Bon Appetit cover story, Roy recalls how he absorbed the “inner secrets of haute cuisine” at this legendary West Hollywood restaurant: I almost turned down the job because I didn’t think I was good enough… but I started out doing simple things, like cutting fish and meat. I also learned more in two and a half years there than I could have anywhere else. Those two (Bertranou and his right-hand man, Michel Blanchet) taught me lessons straight from the School of Hard Knocks. They didn’t take things lightly… I learned to do a dish and work at it until it was perfect. I learned to feel if a dish was right. his young family in order to renew his acquaintance with Hawaii; settling into the eastern side of Honolulu known as Hawaii Kai (where Roy Jr. was eventually born in July 1990). After accepting a James Beard Award for being 1993’s “Best Pacific Northwest Chef” — and Hawaii’s first recipient of this prestigious, peer selected national honor - Roy commented to the local press that he hoped this recognition ends up being just a first step towards proving “that Hawaii has the talent and chefs to compete nationally.” Towards that end, Roy has devoted considerable amount of thought and energy to Hawaii Public Television’s Hawaii Cooks with Roy Yamaguchi. More than a cooking show, the objective of this 13 segments per season series has been to share the beauty and culture of the islands, by telling the story of its food producers, artists, and of course, chefs. Seen in more than 300 stations in all 50 states, as well as in over 60 countries, a seventh series has been taped this year. Yamaguchi has just recently returned from Japan where he taped a segment with the Food Network for their series, “My Country, My Kitchen,” that aired on May 23. In 2001 Yamaguchi was selected to be among the “Iron Chef USA” world-class contingent which includes Todd English (Olives, Figs), Jean Francois Meteigner (La Cachette), and Alessandro Stratta (Renoir). On the literary side, Yamaguchi found the time to produce a brilliantly illustrated cookbook entitled Roy’s Feasts From Hawaii (Ten Speed Press 1995); now in its third printing, and enjoying national and international distribution. A second cookbook will be published in 2003. Also since the mid ’90s, BusinessFirst travelers on Continental and Continental Micronesia between Asia, Hawaii, the West Coast and the Southwest have also been able to enjoy Roy Yamaguchi’s cuisine during their in-flight service. Founded by internationally-acclaimed Chef Roy Yamaguchi, Roy’s restaurants reflect his personal commitment to serve an exciting and innovative Hawaiian Fusion cuisine of the highest quality in an elegant yet casual atmosphere. Further complimented by its cutting-edge wine list, and its famous (and exceedingly friendly) “aloha” style of service, Roy’s is guaranteed to please those in search of the deliciously different dining experience. Roy Yamaguchi holds the distinction of earning Hawaii’s first prestigious James Beard Award. His first restaurant in East Honolulu was dubbed the “crown jewel of Hawaii’s east-west eateries” by Food & Wine , and has been the subject matter of cover stories for both Bon Appetit and Forbes (a rare appearance for a chef) magazines. Among many other distinguished accolades Roy’s has been named to the “Top 50″ in Conde Nast Traveler , the “Gault-Millau Top 40″ in Forbes FYI , and “Fine Dining Hall of Fame” and “Golden Chain” by Nation’s Restaurant News. Roy’s is all about food — unique, beautiful to gaze upon, pleasing textures, and bold flavors — with a taste that is as good as it looks. The menu reflects the highly personal touch of Roy Yamaguchi and his talented culinary team. Flavorful sauces and Asian spices tastefully blended complement Roy’s commitment to the use of the finest fresh ingredients from around the world, with a special emphasis on those locally produced. Guests favorite dishes can be found on the left hand side of the menu while the right side offers a wide array of the day’s Chef’s inspirations. Among Roy’s signature Hawaiian Fusion culinary creations are Hauula Tomato, Maui Onion and Spinach Salad in a warm pancetta balsamic vinaigrette; crispy Thai Stuffed Chicken with a fruit chutney and macadamia curry sauce; and Miso-Seared Butterfish with Chinese five spice butter sauce. Artistically created desserts include the Hot Chocolate Tower, Haupia Napoleon and Fresh Mango Pineapple Upside Down. 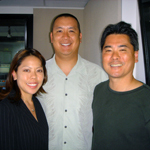 In addition to his restaurant enterprises, Chef Roy Yamaguchi appears as Host of Hawaii Cooks with Roy Yamaguchi seen nationally on the Public Broadcast System. He is author of Roy’s Feasts From Hawaii published by Ten Speed Press. Roy’s cutting-edge wine lists have received numerous national awards for their quality, value and sensible approach to harmoniously pairing wine with food. They feature some of the most rare and unusual selections to be found, many of which are produced and bottled exclusively for Roy’s to compliment the restaurant’s unique and exciting flavors. The restaurant’s signature house cuvees are produced by some of the country’s most respected winemakers specifically with Roy’s food in mind. Roy’s famous “aloha” style of service - straight from the heart with a sense of caring and individuality - is predicated on the mission of its staff to “totally please and indulge” every guest. As guests enjoy Roy’s award-winning food, they are treated to the casual elegance of spacious dining rooms, an expansive lounge area and Roy’s signature exhibition kitchen. Interior design details capture the feeling that one is experiencing something very special. Guests can expect an average cost of dinner at Roy’s to be approximately $45 a person.